Seville is one of the most loved places by visitors to Spain, it is also the starting point of the Via de la Plata route to Santiago de Compostela. Although today Moorish influence is architecturally most evident – Andalusia was occupied by Moors for about 800 years – it has been a cultural center long before this. The fertility of the land and its warm climate with mild winters and hot sunny summers (the mercury can rise above 40°C) made Phoenicians and Carthaginians settle here. Later came Romans, like almost to any place in Europe, and two of their emperors, Trajan and Hadrian, in fact were born here. Seville was also home of famous and infamous figures of history, the legendary “Don Juan” began conquering the hearts of women across Europe. Christopher Columbus set out to discover the New World from a port close to Seville. Prosper Merimée’s “Carmen”, who couldn’t make her decision between the officer Don José and the bullfighter Escamillo – the consequences you can watch still today in opera houses – was a worker in Seville’s old tobacco factory. Seville Sights. 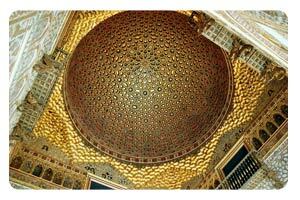 Of all Spanish cities, Seville is one of the most profuse in sights of one kind or another. They include the Cathedraland its bell tower, the Giralda, the Real Alcázar or fortified palace, the Torre del Oro, the Parque Maria Luisa, an Archaeological Museum, a Museum of Arts and Customs, the Charity Hospital, the Fine Art Museum, the bullring, called the Plaza de Toros de la Real Maestranza (which vies with Madrid’s Plaza de Ventas to be the most important bullring in Spain), the quirky Casa de los Pilatos, the Roman city of Itálica just outside the city, the University (once the Fábrica de Tabacos or Tobacco Factory, yes, the one in Bizet’s Carmen), the Archivo de Indias, an untold number of interesting churches, and much more. Food and Drink. Apart from being the world tapas capital, in relation to the rest of Andalusia, Seville’s gastronomy is representative rather than distinctive. Gazpacho, the famous cold soup of tomatoes and other vegetables (gazpacho andaluz, naturally) is delicious, nutritious, cheap, available everywhere and a real boon for travellers. Salmurejo, a smoother, particularly filling kind of gazpacho, is not normally available in tapa form, but makes a great first course. Huevos a la flamenca is eggs baked with tomato, chorizo and/or ham, and worth trying if only because nowadays eggs are rarely cooked in the oven anywhere else. Cola de toro is supposed to be stewed bull’s tail, but more likely to be oxtail. Pescaito frito, little fried fish, sometimes so small they could be considered fried fry (in which case they are illegal) is a delicacy among tapas. Seville has no wine-producing region of its own, but sherry and sherry-type wines are much liked, especially the very pale, dry, fino sherry or the more aromatic manzanilla from Sanlúcar. Beer drinkers will find the local brew, Cruzcampo, quite satisfactory when served very cold, and much the same could be said about San Miguel, the other beer commonly found in Seville.